The 2013 ChemShow is the latest in the series of biennial Chemical Industry Expositions based in New York City and organized by the International Exposition Company (IEC). 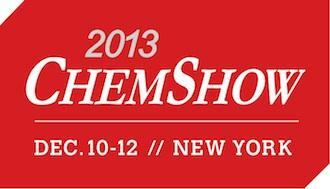 This year, the ChemShow will be accompanied by the 2013 AIChE Northeast Manufacturing Conference. The program's format makes it easy for attendees to take in the expo floor while still attending the conference sessions or tutorials. The conference will focus on improvements and technologies in manufacturing specifically geared toward engineers working in industry in the northeast. Sessions at the conference will address energy savings and efficiency, environmental issues, new and improved operating equipment and environmental health and safety. Preceding the conference will be a day of tutorials that range from engineering fundamentals to plant and equipment basics. The combination of in-depth classroom knowledge and show floor demonstrations will make the 2013 ChemShow and AIChE Northeast Manufacturing Conference a unique educational experience. G. Sam Samdani, PhD, is a senior industry knowledge expert at McKinsey & Company, a global management consulting firm. He will give the Northeast Manufacturing Conference's plenary talk. Students from the engineering schools in the Northeast region are invited to learn about the experiences of practicing young engineers from different business sectors. Keynote address by Executive Recruiter Jess Stinson, Senior Consultant, Executive Search at Century Associates, will speak on “Career Insider Trading – Insights on Getting the Best Return on your Job Search Investment”.